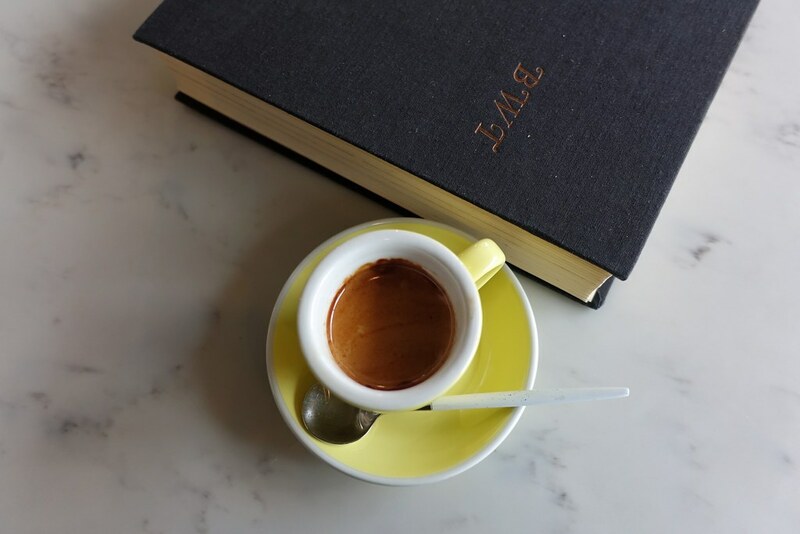 Use this handy Foursquare list to find all of the cafes covered in this series of best cafe and coffee shop roundups. New specialty coffee shops continue to open in New York City at a furious rate, and I’ve given up trying to get to all of them. However, I still (eventually) make it to a lot of them and write about the ones that are special in some way, or fill a void in a previously underserved neighborhood. The bulk of the cafes I’ve visited lately that have opened in the last few months are in Brooklyn, with a couple in Manhattan, and one in Queens. Collectively they use coffee from a striking variety of roasters, mostly local, but some further afield. 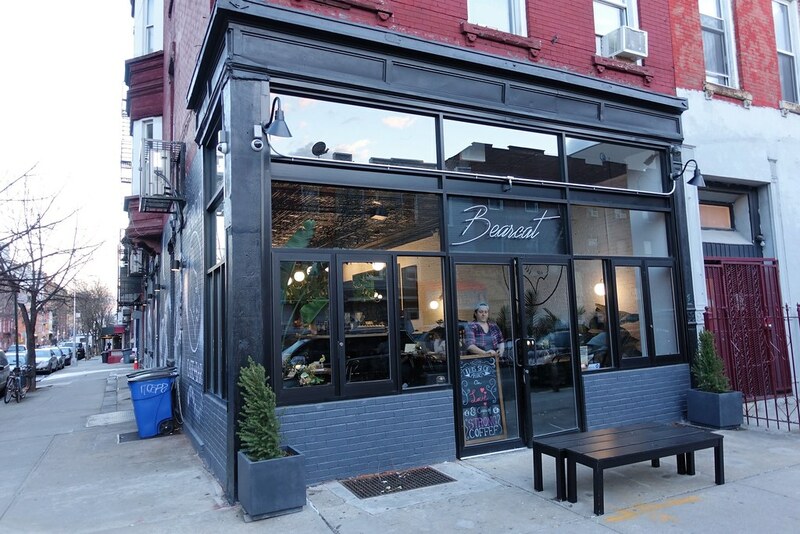 Bearcat is an East Williamsburg shop near the Montrose Ave subway stop that presents more like a bar than a coffee shop, which isn’t surprising considering that its primary purpose is to become a bar/restaurant in the near future. That hasn’t stopped laptop campers from taking root and using the wifi and plugs. Coffee is Forty Weight , roasted in upstate New York. With the lease running out on their former flagship on Berry St in Williamsburg, Blue Bottle is moving their roasting facility and training lab into a giant, high-ceilinged Bushwick warehouse space that was originally meant to house the combined operations resulting from their (failed) merger with San Francisco’s Tartine Bakery. The light, airy space is anchored by an inviting, partially-glassed in coffee bar that occupies the entire center of the public area; seating is comprised of six two-tops along a banquette wall and nine stools along the back wall that face the giant roasting and lab operations beyond. 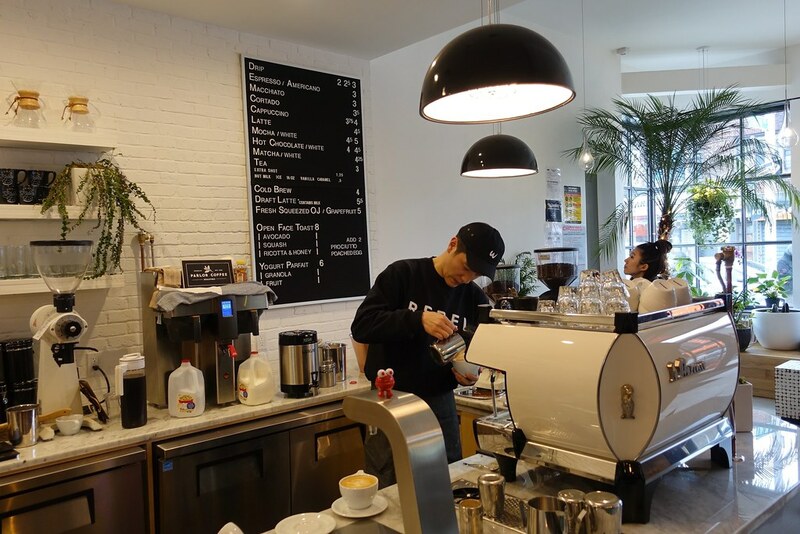 Japanese-run Cafe Cotton Bean in Crown Heights, which began life on Kickstarter, uses the coffee that many design-conscious shops choose (or possibly it’s the other way around), Parlor, roasted near the Brooklyn Navy Yard. The comfortable, all-white interior has a few tables and seems to invite you to crack open that novel over a well-crafted espresso. They also are one of the only shops I know of in New York City offering coffee jelly (a fairly common Japanese dessert) made with good coffee – there’s also a matcha version. This strange and intriguing open shopfront was spotted by my shotgun, fellow food and coffee explorer, Premshree Pillai of Polkadot Socks, as we headed along Bedford Ave after leaving Cafe Cotton Bean a few days ago. 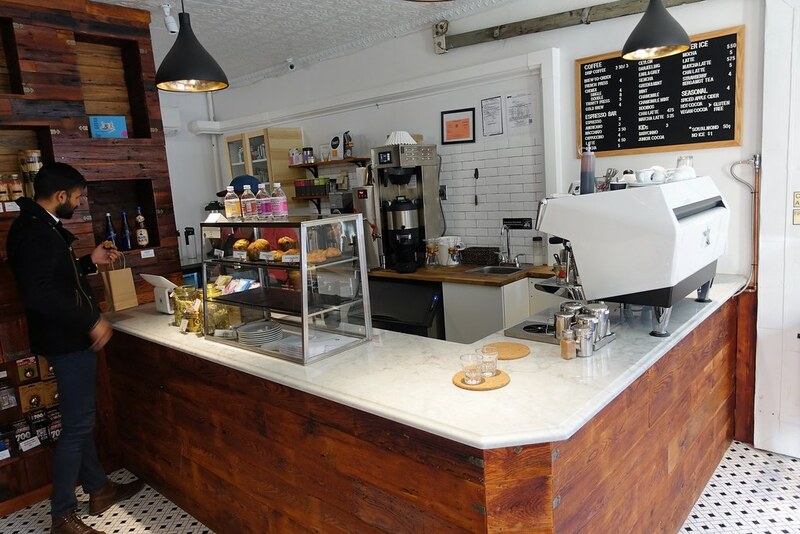 Helmed by Markiss Koffee, Coffee Snob, which uses Toby’s Estate Coffee, occupies a converted garage space adjacent to Bedford Hall, with plans to use the bar for daytime seating and food service. Shots are pulled with care on an old school lever espresso machine. 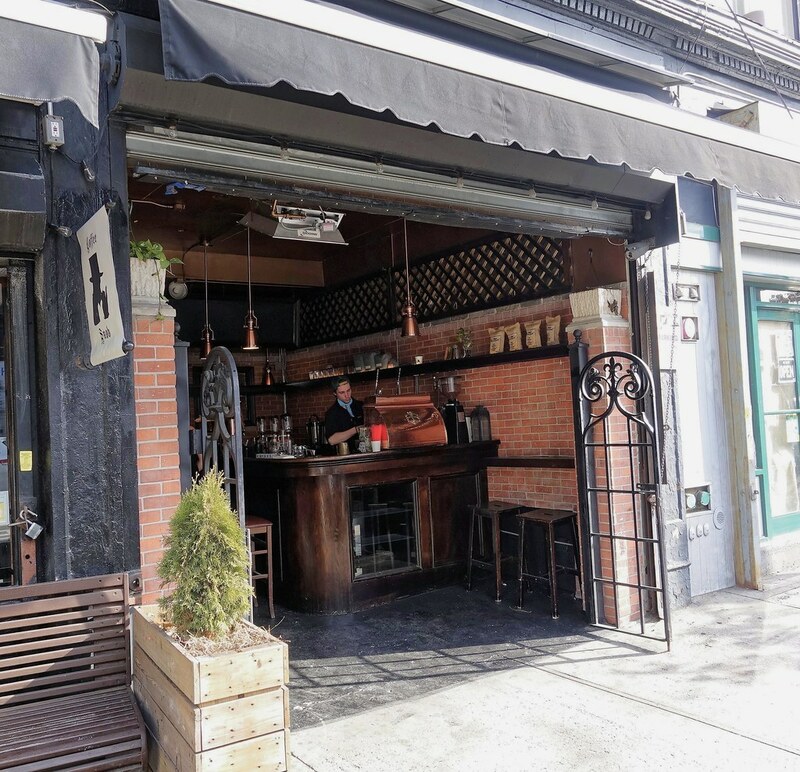 Warm and friendly Dot & Line is a small shop, with just a few window seats, located on a Boerum Hill side street at the point where commercial ends and residential begins. 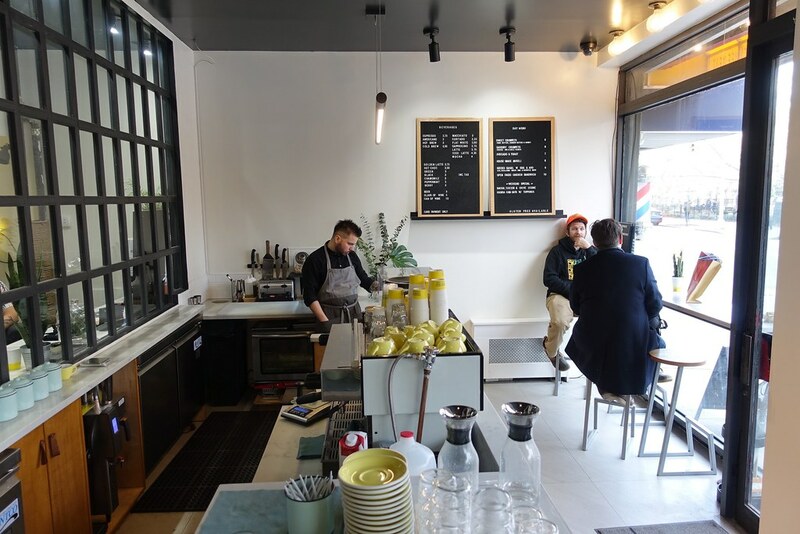 Despite using an automatic espresso machine, they seem fairly serious about their coffee, preparing drinks using Heart (roasted in Portland, Oregon), and sporting a shelf of covetable coffee gear. 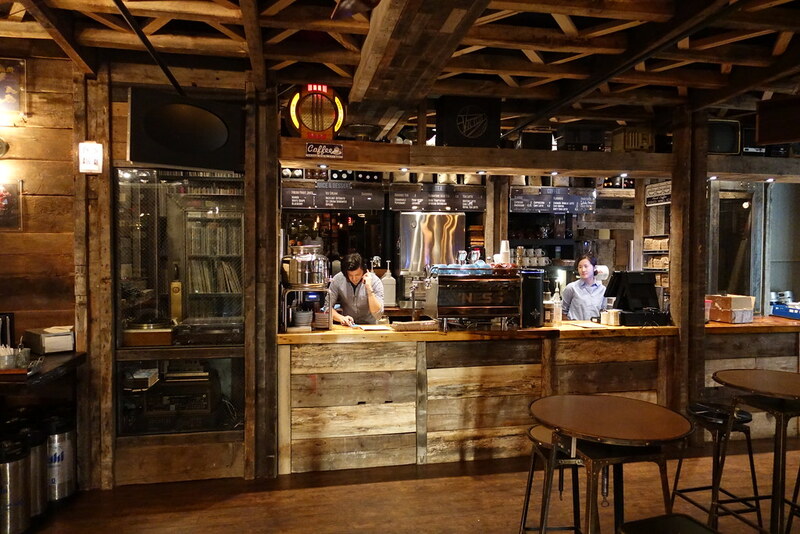 They’re also the first in New York City to use a multi-purpose brewing device I’ve never heard of, The Trinity One, built in Brisbane, Australia. 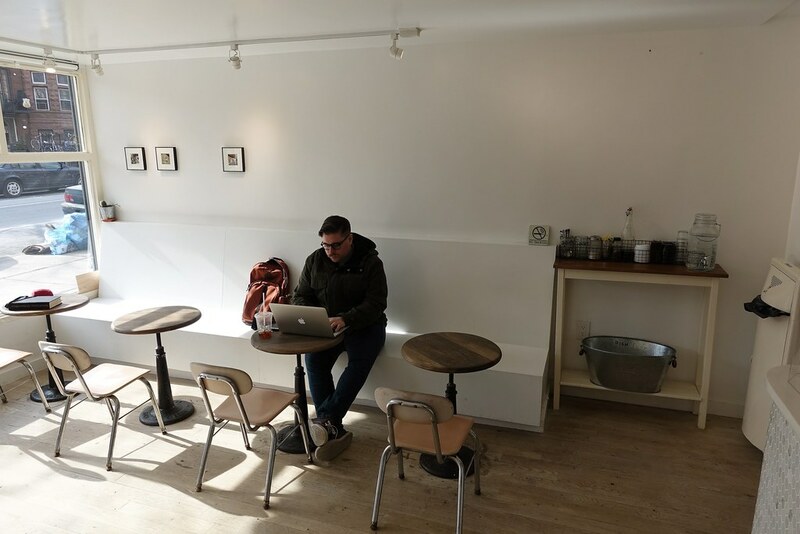 Despite the serious-sounding name, Espresso Me is a more cookie-cutter style shop near the foot of Atlantic Ave that welcomes laptop users with fast wifi and lots of plugs. 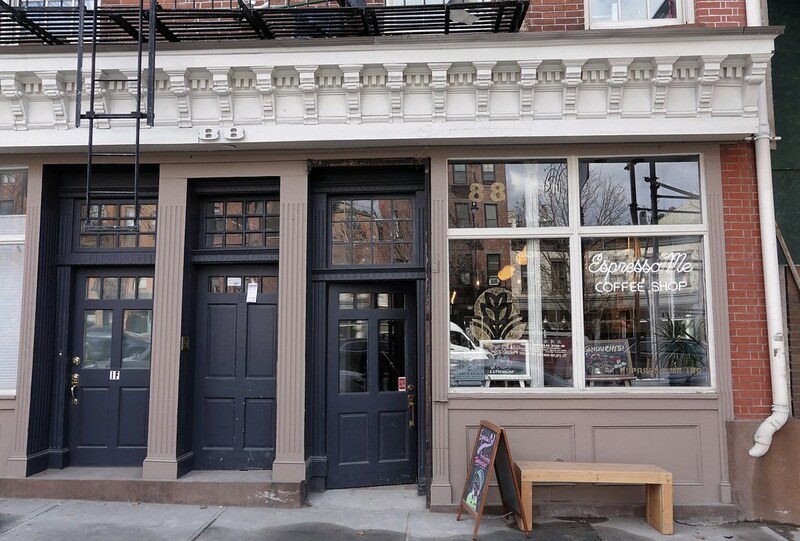 They use Toby’s Estate Coffee, roasted in Williamsburg, and offer a familiar slate of baked goods plus a handful of sandwiches and other light food. There are more than three seats in this shop – 19 to be exact; their moniker refers to the barber shop tucked away in the back (expert barbers btw). This is my kind of place: cozy, friendly, good coffee, attention to detail. Great design pervades the entire shop, from the tumblers, to the demitasse spoons, to the stools, to the craftily built interior – a masterpiece of small space usage. The Ceremony coffee, roasted in Maryland, is meticulously prepared on a workhorse La Marzocco. Food offerings includes sweet and savoury crumpets and there is wine and beer as well. Cards only. This Korean-run hideaway on the 5th Floor of a Koreatown office building is a specialty coffee oasis amidst the craziness of Herald Square and 32nd St. Decorated with music-oriented bric-a-brac that tries a little too hard, and a huge sound system on the back wall, the cafe, which is a non-branded offshoot of Flushing’s Cafe de Cupping (and uses the same self-roasted coffee), opens at 11:30am and morphs into Turntable Chicken Jazz (!) around 5:30pm. Wifi. White Noise is an attractive, gargantuan cafe located in the Murray Hill, Queens commercial district. There are myriad seating options for the crowds they draw including tiled window benches running along 162nd St, a row of two-tops w/ plugs on the lefthand wall, round cafe tables and large communal tables in the middle, and some plush chairs and a couch in the back. White Noise uses Parlor Coffee and does a decent job with it, but some of their other drinks are not up to par; the matcha latte has no tea flavor – it’s merely sweet and green, and the pricey draft La Colombe latte w/ supposedly homemade vanilla syrup has a chemical tinge. Wifi is spotty.